A two bedroom cottage that is in the heart of it all! Less than 3 blocks to the beach & downtown shopping/restaurant district, Azalea Cottage is a beautiful, meticulously maintained two bedroom property within easy walking distance to historic downtown Ocean Springs, as well as beautiful Front Beach. 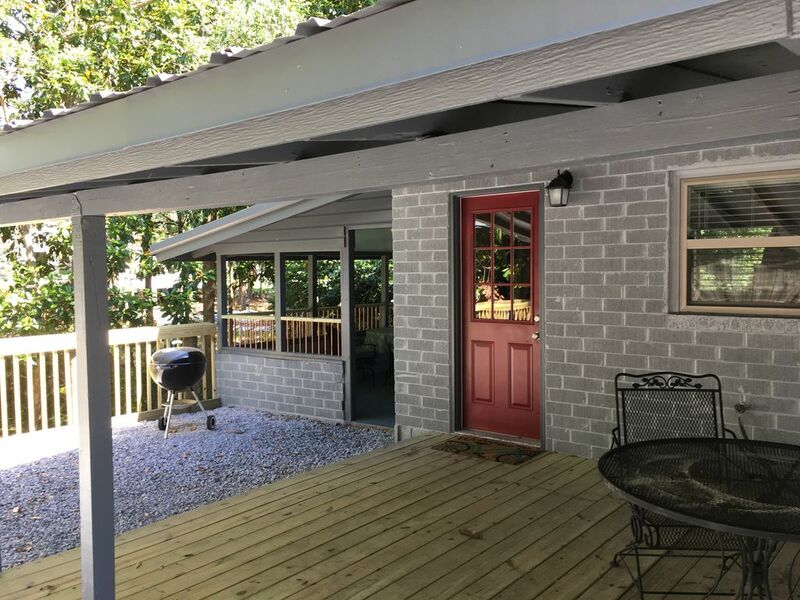 Newly remodeled with all the amenities you need, Azalea Cottage is the perfect place for a romantic weekend getaway, as well as week-long vacations with the family. Inside you will find a clean, impeccably decorated space with all the conveniences of home. Azalea Cottage features a large open kitchen with stainless steel appliances and granite counters. The custom cabinets are filled with virtually everything you'll need to prepare your meals. The marble & glass dining room table is perfect for romantic dinners, and bar-stool kitchen breakfast bar offer additional dining space that kids love. The kitchen features stainless steel appliances and offers plenty of space for preparing meals on days you rather stay in the comforts of home, rather than eating out at the numerous Ocean Springs hot-spots. The living room provides a comfortable place to lounge in front of the large flat-screen TV, as well as a pull-out queen-size bed for additional sleeping arrangements. In the Master Bedroom you'll find a luxurious, memory foam queen bed, and the guest room has two twin-sized beds. Both have flat-screen TVs with cable. A large covered deck is out back surrounded by nature, perfect for relaxing or entertaining. A grill is also on property. Azalea Cottage is the perfect place for your vacation. Book your stay today! Queen-size pullout couch, flat-screen TV with surround sound. Full kitchen with stainless steel appliances. Glass & marble dining room table seats four with three barstool seating at breakfast bar. Additional seating on outdoor covered patio. Adorable but Pub across driveway. Very cute, clean, updated garage apartment. Only reason I am rating a 3 is because of the Pub next door. The band or music played until around Midnight on a Sunday night. If I had not brought my own fan (guest room had one) I would not have been able to even read much less sleep. Very disappointed. So needless to say, bring a fan and earplugs, otherwise very cute and close to everything. Hi Janice, so sorry to hear that your stay wasn’t a 5 star like the overwhelming majority of our guests (you’re actually the first person in nearly 2 years of renting that has done so). I wish you would have contacted me about the pub’s loudness and I would have gladly contacted them to have them turn the music down. They usually have acoustic music, so it must have been a rare electric performance. Again, sorry about that. Not sure why you called the home a garage apartment though. It’s not attached to a garage whatsoever. It’s a two bedroom home with full kitchen, dining area, and living room. Maybe you got us confused with another place you stayed at? Cute cottage convenient to downtown. I absolutely loved this home. It was perfect for my friends and I. The decor is cute, the appliances were up to date, the house had everything we needed. Ample space and the beds are sooooo comfortable 😊 definitely will be renting this space again! Staying here was like being at home, just on a smaller scale. We especially enjoyed the outside areas and the location of the cottage. The beds are super comfy and it was extremely quiet. Best of all was how safe it is here. We will definitely stay here next time we come this way. We had a great weekend here. The cottage is not large, but is in great shape. We could not figure out how to get the cable to turn on and wished it had a blender, but most other amenities were great. It is a short walk to the beach or downtown. We would stay here again!